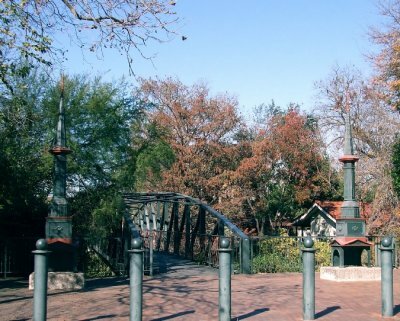 The pedestrian bridge and spires are copies of the original bridge on Commerce St.
in the King William district. The bridge was dismantled in the 1960s for river redevelopment. In 1983, this replica bridge was placed at the same location on Johnson Street. © Copyright 2005-2019. These photographs are private property. Please contact me before you copy.